When the position lights are turned on with the ignition switched ON, the brightness of the instrument panel illumination is dimmed. NOTE When the position lights are turned on, the position lights indicator light in the instrument cluster turns on. Refer to Headlights on . The brightness of the instrument panel and dashboard illuminations can be adjusted by rotating the knob. 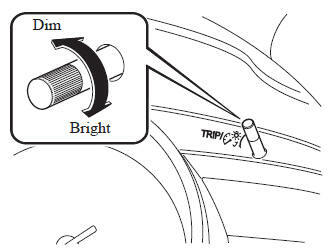 The illumination dimmer can be canceled by rotating the dashboard illumination knob to the right until a beep sound is heard while the instrument cluster is dimmed with the ignition switched ON. If the instrument cluster's visibility is reduced due to glare from surrounding brightness, cancel the illumination dimmer. When the illumination dimmer is canceled, the instrument cluster cannot be dimmed even if the position lights are turned on. When the illumination dimmer is canceled, the screen in the center display switches to constant display of the daytime screen.